Chicken pox is incredibly infectious and is caused by a group of the herpes virus. This illness causes mild flu-like symptoms as well as a distinctive rash. Most kids get chicken pox at a young age and it is almost always mild. If your baby has the virus, it will take somewhere between 10 and 21 days for the symptoms to begin appearing. Your baby is only infectious from the time two days before his rash appears until after the point when all of the spots have gone away (despite having the virus, he is not infectious before this point). Most of the time this process will take five days; if your baby attends childcare or a nursery you should keep him with you at home for five days beginning when you first see the rash. Read on to learn how you can treat and prevent chicken pox in babies. Chicken pox is also known as varicella and this illness usually causes a rash that is itchy and begins with small red bumps. After very little time the bumps will become blisters that are clear and fluid-filled sitting on a pink base and then eventually turn to dry brown crusts. It is common for someone with chicken pox to experience several waves of blisters throughout the illness. Most of the time the rash will first appear on the trunk, face or scalp. After that it will spread all over the rest of the body. Children will usually have a total of 250 to 500 blisters although some have only a few in total. Chicken pox is the result of the virus varicella zoster and this virus is easily passed between people which leads to the highly infectious nature of the disease. Once your baby is exposed to the disease, it will take anywhere between 10 and 21 days for the pustules to first appear although the average is 14 to 16. The virus can be passed if someone with the illness touches their blisters and then touches you or if they cough or sneeze into their hand. It can also be spread in the air through coughing, sneezing or even breathing. It is also possible to get chicken pox from coming into direct contact with the fluid found in the blisters before they have crusted over. Because shingles is caused by the same virus, it is also possible to get chicken pox from someone with that condition. Certain children are at a higher risk of complications when they get chicken pox and those include those with a weakened immune system (due to a chronic condition like leukemia) as well as those who take high-dose oral steroids (such as to treat asthma). There are special protective measures that can help but only be used right after your child’s exposure to the virus and these include getting an injection of the varicella vaccine or varicella zoster immune globulin. Because of this you should immediately call your doctor if your child has a compromised immune system and was exposed to chicken pox. Is Chicken Pox in Babies Dangerous? Most of the time chicken pox is only a mild irritation for healthy children. Despite this, it is possible for healthy children or babies to develop serious complications including brain swelling (encephalitis), pneumonia or a bacterial skin infection. If you notice your child has chicken pox and is sicker than he should be, you should contact the doctor. You should also contact your doctor if there is a fever later than the first several days, if the skin surrounding the pox is red, painful or swollen or if the rash goes to his eyes. 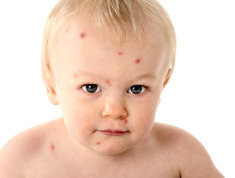 If your baby has chicken pox, keep in mind that he will be contagious starting two days before the symptoms appear. Because you will most likely not know he is sick at this point, the best you can do is to keep him home from nursery until all of his sores have completely crusted over. During your baby’s recovery, the most important thing is to help reduce the itching. You can do this by giving him a cool bath at three to four hour intervals. To give some additional relief, try adding colloidal oatmeal or baking soda in the bath. You can apply calamine lotion after the bath. You should also try to prevent your baby from scratching and picking at his sores. This can slow down the process of healing, lead to scars or even skin infections. One of the easiest ways to prevent scratching is to cut his nails. You can use acetaminophen or ibuprofen to lower your child’s fever and if he seems very uncomfortable, you can talk to your doctor about over-the-counter antihistamines for children. There is an antiviral drug named acyclovir which can be used to help treat chicken pox but most doctors don’t recommend it for healthy children. It is very helpful, however, for those with weak immune systems. The best way to prevent chicken pox in babies is to give your child the vaccine. This vaccine has been around since 1995 and is recommended at between 12 and 15 months of age followed by a second shot between the ages of 4 and 6. This vaccine is effective at keeping over 95% of people from developing a serious case of the illness and it will cause very few side effects if your child is healthy. There are some situations in which you shouldn’t give your child the vaccine, however, and that includes if he is severely allergic to gelatin or antibiotic neomycin or if he had a poor reaction to his first dose of the vaccine. If your baby or child has any immune system disease such as cancer or a recent blood transfusion or takes a high dose of oral steroids, his doctor will determine whether he should get the vaccination.